Here’s a simple idea for how to make an Easter bunny. 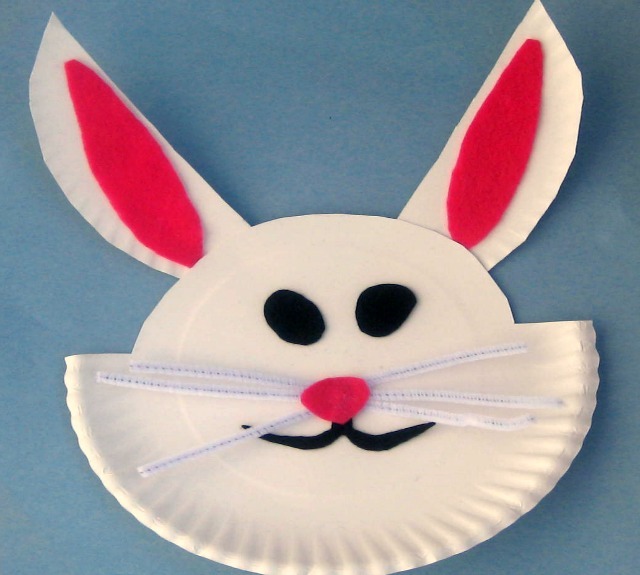 It’s amazing what a cute Easter bunny craft can be made from a paper plate! It is always amazing to me that simple everyday objects can be transformed into something cute and creative in a matter of minutes. Take this paper plate bunny for example. He is made of a bright pink and a black felt square, a paper plate, glue, and white pipe cleaners. It didn’t take long to transform those objects into a bunny that will brighten our kitchen for the month of March. So here is how to make an Easter bunny. We started by cutting the top outside edge off of a paper plate. It was easy to cut long the inside ruffled edge to remove this section. Then two vertical slits were cutting into the plate to create an area to thread the pipe cleaners through. We barely folded the plate to cut the slits. I didn’t want the bunny to have a permanent crease in the middle of his head. Then we thread the pipe cleaners through the cuts we had made in the plate. It took a little wiggling to get the third pipe cleaner in place. I think we could have made the slit a little bit wider. The bunny’s nose and mouth were then cut out of felt. The nose was my son’s job and I took care of the mouth. Cutting the mouth’s narrow grin would have been a little tricky for my four-year old. He was all over trying to cut his eyes out of felt. I did trim them a little it to smooth out rough edges around them. You may decide that you like the rough edges and leave them just as they are. Finally the ears were added to the top of the rabbit. We were able to use the same pink felt to line the rabbit’s ears. We had to cut his ears out of a second paper plate. The outside edge with the ruffle on it was used to make his ears look fluffy.